I hate to be a short-order cook, but sometimes my husband and I have very different tastes when it comes to dinner. If it were up to him, he’d eat Chinese food every single night, and if it were up to me, I’d eat pizza and spaghetti. I don’t cook separate meals for us every night, but on certain nights when I’m craving Italian food, I’ll make Austin something else that’s quick and easy so that I’m not in the kitchen any longer than usual. I thought I’d share a peek at what those kind of nights look like, in case you’re in a similar situation and need a fast meal idea– whether you’re cooking for one or for a whole family. The key to quick meals in my house is preparing ahead and taking advantage of our freezer. I’ll often prepare a double batch of our meals and freeze the other half for an easy meal in the future. 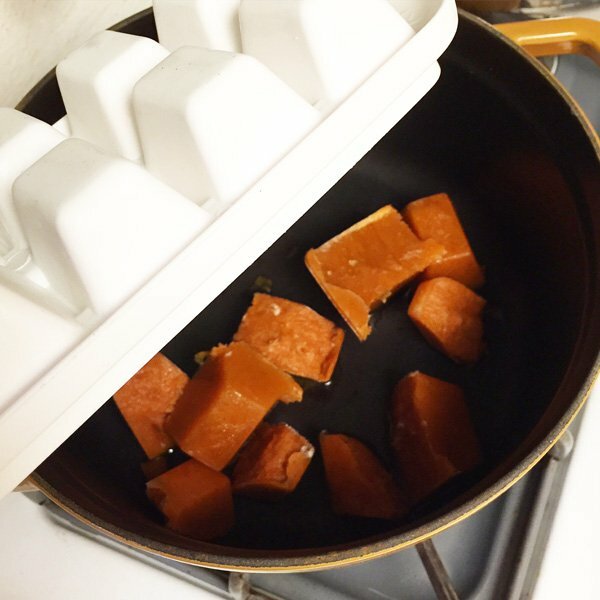 Last week I made my Red Pepper Cream Sauce over sweet potato noodles, but I made a double-batch of the sauce and froze it in an ice cube tray (you can also use these awesome silicone trays that come with a lid). I love freezing sauce into cubes because it makes the sauce really easy to re-heat later in any portion size you need. When I needed a meal for Austin last night, I emptied half of the frozen sauce cubes into a sauce pan over medium heat and added half a bag of frozen veggies. The frozen items started thawing in the pan while I prepared my dinner, which was a simple sauté of red onion, bell peppers, shredded cabbage and leftover pizza sauce– a cabbage “spaghetti,” if you will. I had both dinners cooking at the same time, and once the frozen stuff melted I added in a cup of cooked quinoa (which we always have ready in the fridge) and some chopped chicken to Austin’s meal. Everything ends up being warm and tender all at the same time, with only about 10 minutes of total effort. Win, win! If you haven’t tried using shredded cabbage as a veggie-based “noodle,” I highly recommend it. When you buy it pre-shredded, it’s faster than using a spiralizer and has a less-watery texture when compared to other cooked veggie noodles, like zucchini or spaghetti squash. Come to think of it, a lot of the meals I eat on a regular basis are ready in less than 10 minutes. As much as I love cooking, I don’t want to spend my whole day in the kitchen, so I like to take a few minutes over the weekend to prepare ahead of time. I always make a double-batch of salad dressing each weekend so that my lunch salads during the week can come together in no time, and my smoothies each morning are always ready in 5 minutes or less. Thankfully Austin will share my smoothies with me, so that’s an easy thing to make for the two of us each day. For more time-saving tips, be sure to check out page 12 in Everyday Detox! 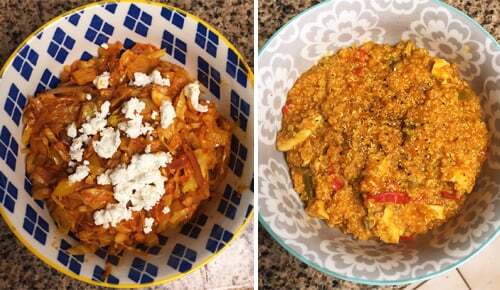 Reader Feedback: Do you ever make separate meals for your family? What are your family’s favorite meals to share? Hi, Megan. Thank you so much for your knowledge in food combination and the key to living a healthier life. The food combining tips actually clicked and my recent digestion issues make total sense. I have been pairing food from different groups. Thank you. I love your blog! I also have your book and love that as well! I really should start freezing things in ice cube trays to make my weeks easier. Seeing how quick you’re able to make a weeknight meal just shows me I need to take the few extra minutes to do it! 🙂 Thanks for sharing! Great ideas! I’m curious about meal combining and men… My hubby eats a ton! How do I add more meat while meal combining? Lots of neutrals I guess!? These are great tips! I especially like the ice cube tray idea. I have been freezing my gluten free desserts – so I don’t eat them all 😉 But this also means when I have guests it’s one less thing to worry about. Sounds so easy! How do you limit yourself only to one serving?!? I always end up getting seconds!!! I am always on the lookout for quick and easy meal ideas. I love tackling a more complex recipe occasionally, but usually I like meals that fit within my busy day! Yum! Thanks for the quick meal ideas. Going to buy some shredded cabbage next time I’m at Trader Joe’s! I love having some set meals that take almost no time to make, that way I have options when I’m super hungry or busy and don’t have to think about it! Your easy examples of how you manage real life are so inspiring! I love food to be easy, healthy and fast, so I can’t get enough of your stuff! Thanks so much and keep up the great work! Hi, I love your recipe ideas, they are fabulous! I’ve tried the banana and peanut butter ice cream, yum! My husband and I love love it! I’m the cook in the house and starting to get my eaters to a more plant-based diet. I’ll be purchasing your book soon so I can try those recipes. I signed up for newsletters but never got the 21day kick start. Would I be able to still get that? The idea of freezing sauce in ice cubes is amazing! I need to try that for myself. Given I currently live on my own and cook just for myself there are no separate meals. However, I remember my mum occasionally catering everybody’s palate by – for example – preparing a vegetarian main dish and meat or fried eggs on the side. Not two separate meals, though, because like you said: meal prep on week nights should usually be fast.